Given the live nature of the American Music Awards, Adam Lambert’s performance, which differed greatly from his rehearsal, caught many, including the network, off guard. This is not a question of Lambert’s sexual orientation. As is evidenced by GLAAD’s media report card, ABC is at the forefront of positive gay and lesbian portrayal on television. We welcome openly gay performers and look forward to continuing our great work within the LGBT community. ABC may have cancelled Adam Lambert’s future appearances, but they didn’t do it because he’s gay, so homophobia couldn’t be playing any part in this circus whatsoever. And besides, there’s that great report card, which is like how you can’t be racist if you’ve got black friends. If they both say so, it obviously must be true! The issue is not so much about homosexuality, although I believe the preponderance of Americans find public hyper-sexualized acts of homosexuality particularly off-putting. But the issue was more of indecency and what is decency. And frankly the issue is one of law. We believe this performance met the threshold for violation of federal law and violation of FCC regulations. And the Supreme Court has held time and again that there’s not a First Amendment right to engage in public indecency as evidenced by the outcry and complaints that poured into ABC. We believe that this violated contemporary community standards in terms of what is and what isn’t decent. Nope, no homophobia here! Their claims of indecency are 100% legitimate because people don’t want to witness anything that’s hyper-sexualized AND gay. That’s not bigotry, people. That’s just maintaining some standards of decency! And what about Kara DioGuardi’s sage wisdom that ABC’s move is all about appeasing advertisers? Well any viewers (and the accompanying ad revenue) lost from future appearances of that dirty, filthy Adam Lambert could never in any way be accused of being homophobes. Oh wait. We already did. I sincerely appreciate that GLAAD exists as an organization to help the GLBT community have a voice in mainstream media, but I don’t like the fact that they’re speaking on our behalf yet refusing to address the very big and very pink elephant in the room. ABC doesn’t have to cancel Adam Lambert’s appearances because he’s gay to make this situation a homophobic one. No, their decision gives credence to the bigoted opinions of critics like Liberty Council and the ignorant audience that would cost ABC ads because the mere thought of Adam Lambert repulses them. That is what makes about homophobia, and that is what puts ABC in the wrong, and that is why it’s such an embarrassment to see GLAAD so willingly co-sign this decision. This entry was posted on Friday, December 4th, 2009 at 5:41 pm and is filed under Music, News, Rants and Television. 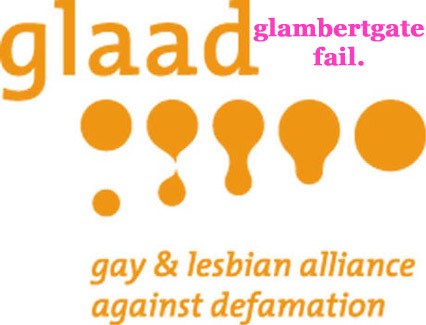 Tagged: ABC, Adam Lambert, Controversies, GLAAD, GlambertGate, Homo Things, Homophobia, Liberty Council. You can feed this entry. You can leave a response, or trackback from your own site.